Porter Farms & Nursery is a family farm offering locally grown fruits and vegetables at our Farm Market. Our produce is picked fresh each morning and is grown on the 100+ acres planned, seeded, and tended by farmer Ashley Porter. Taste the fresh difference of NC produce grown by local farmers. Our roadside produce stand and old-timey homemade ice cream parlor is located just 20 miles south of downtown Raleigh in Willow Springs, NC. Get Directions. Porter Farms & Nursery is a family farm offering locally grown fruits and vegetables at our Farm Market. Our produce is picked fresh each morning and is grown on the 100+ acres farmed by Ashley Porter. "If it ain't in season, we ain't got it." Our North Carolina produce is picked at its peak to ensure your family tastes mouthwatering fruits and vegetables the way they were meant to taste. Other places give top priority to shelf life. Not us. At Porter Farms our motto is "ripe here, ripe now". Check out our Crop Calendar and compare the varieties we offer with your local grocery store or other produce stands. You'll love the natural difference in freshness and taste. 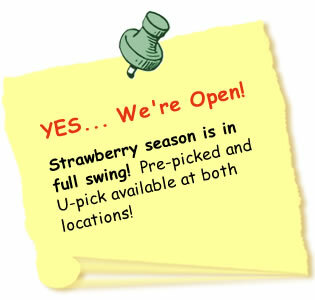 Strawberry Picking from mid-April to early-June at either of our two NC strawberry farm locations or let us do the picking and buy from our stands. Sweet, red, and ripe! Farm Fresh Produce available from late spring to summer. Only the highest quality of locally grown fruits, veggies and herbs. Fresh is better! Homemade Ice Cream made from the freshest NC dairy and naturally organic. Treat yourself to a hand-dipped scoop of our rich and creamy ice cream at our Willow Spring location. Pumpkins and Mums are available in fall. Pick from the largest variety of pumpkins, gourds and garden mums for a most colorful autumn. We were the first stand in the state to receive this honor from The North Carolina Department of Agriculture. Learn more about Porter Farms. 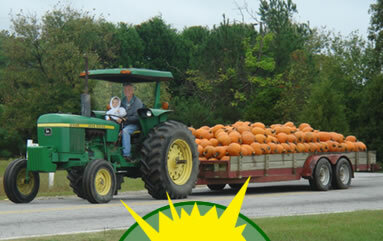 Raleigh NBC 17 featured Porter Farms in: Drought Conditions Slash Pumpkin Crops. Watch the Video or Read the Story.